In Cotati, California, researchers recently discovered a chimeric albino redwood. Albinism, which affects roughly 230 known redwoods in California, prevents the tree from producing chlorophyll--an essential biomolecule that helps plants absorb energy from the sun. An inability to photosynthesize usually causes stunted growth and parasitic-tendencies in albino redwoods, which typically grow in connection to a larger, healthier tree. However, the Cotati tree is remarkably healthy—proudly standing at 52 feet tall. The tree is a chimera: a plant that has normal tissue and albino tissue within a single specimen, as seen by both it’s green (normal) and pale-yellow/white (albino) needles. There are only ten other known chimeric albino redwoods, all of which are relatively small, weak trees. Even more remarkable: the Cotati tree produces both male and female cones, something experts have never seen before. There are two primary theories for the cause of albinism in redwoods. One, that cell division over hundreds of years in a redwood tree’s lifespan cause genetic and cellular mutation in the cambial layer, thereby creating a mutation error. Another, that environmental factors cause redwoods to adapt in order to accommodate stressors, such as the recent droughts in the western United States. 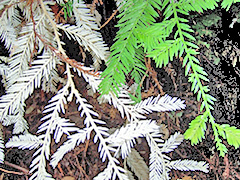 Experts are hopeful that botanists and geneticists will be able to understand the cause of albinism in redwoods by studying the tree’s rare combination normal and albino tissue. Posted on March 28th under Global Ecology.